Take advantage of expert suggested solution to Open, View and Read PFC file outside the AOL environment. 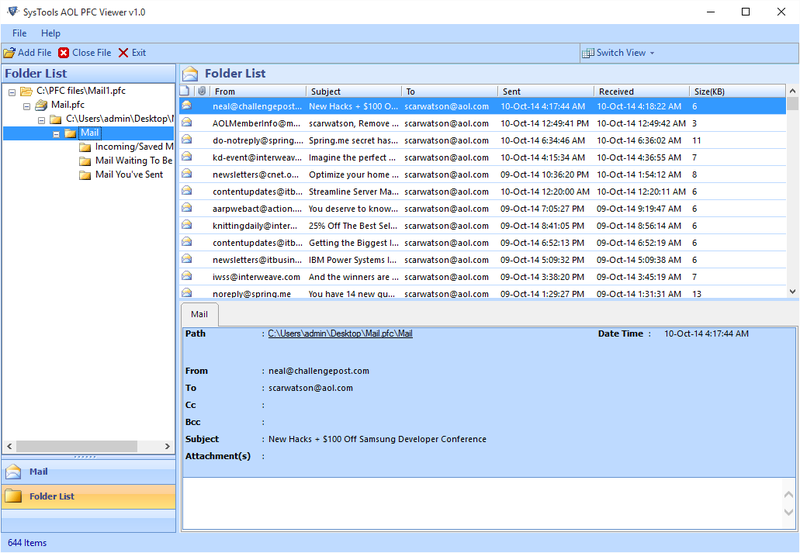 The PFC file viewer provides the preview of PFC emails within the tool along with corresponding attachments. AOL installation is not required. View PFC file mail along with corresponding attachments. Free tool to View Large sized PFC file. Support's all the latest & earlier versions of the Windows OS. Open the PFC file e-mails by using a tool. It will provide the preview of all the items along with corresponding key attributes of the mail message such as To, From, Subject, Received, Cc, Size of every mail message. Open & Read all the mail items of the PFC files without AOL, preview the messages along with associated attachments. Users can see the attachment file in the preview pane with their file extensions. The PFC file viewer software first scans the PFC file and then Provides the preview of all the mail items of the file. PFC file viewer has ability to scan any sized PFC file, size limitation is not defined for this tool. This tool is compatible with all the latest and previous versions (2016/2013/2010/2007 and below editions) of the Windows Operating System(32 and 64 Bit). What is AOL PFC File Extension? PFC file is a Personal Filing Cabinet, it is a file extension of AOL (American Online) application database file. These files are created in AOL, which is used to store the email messages, contacts information & user's bookmarks. PFC is a filing system which coordinates and stores the email messages on local machine hard disk so that user can access their messages in offline mode. Sometimes users logIn with different account and not able to access the AOL desktop application Or Someone sent you a PFC file you want to open it in your local machine without AOL application. 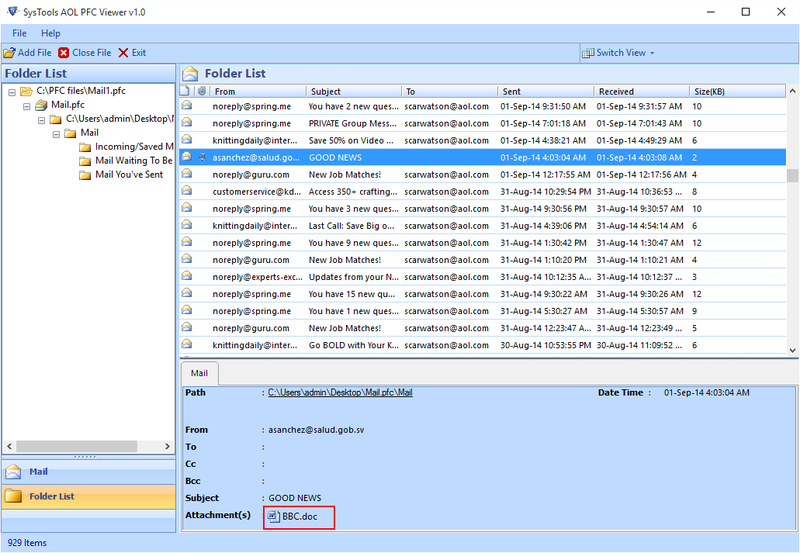 In this scenario Free PFC File Viewer will help you to view & read PFC mails without AOL. Every account or username has its own individual PFC (Personal Filing Cabinet) file in the Organize folder. 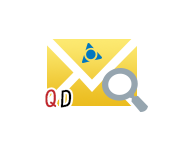 Each PFC can be accessible only from PFC file reader if it is not accessible by AOL application. nges that Windows users face when they find .olm file with them, are overcame by this product. What all details does your software loads when OLM contacts are loaded within it? The OLM viewer shows contacts information with their multiple email addresses, contact numbers, and all associated data. I cannot open OLM file on Windows 8.1 OS with any of the preinstalled application. Is it possible to resolve this problem via this freeware? Yes, of course, the motto of delivering the software is to open and read OLM file on PC without Outlook. Will your software support OLM file of Outlook for Mac 2016? Yes, OLM explorer works with .olm file of Mac Outlook 2011 and 2016 application. OLM file reader is the excellent tool to view orphaned OLM file on Windows 10. The advance technology used in this product saved my lots of time and attempted my complete task in fractions of seconds. There is no risk of data loss in the existing data and the amazing thing is that the reader displays folder in the same structure as the earlier one.